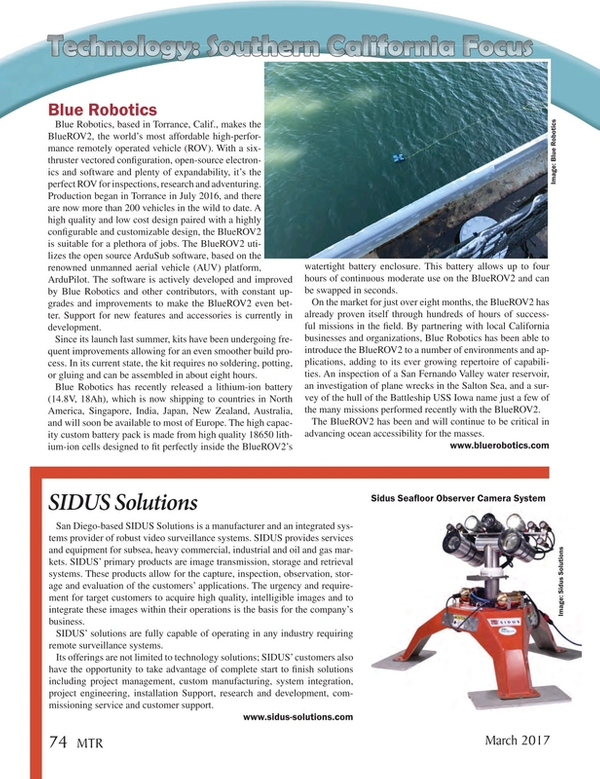 Blue Robotics, based in Torrance, Calif., makes the BlueROV2, the world’s most affordable high-performance remotely operated vehicle (ROV). With a six-thruster vectored configuration, open-source electronics and software and plenty of expandability, it’s the perfect ROV for inspections, research and adventuring. Production began in Torrance in July 2016, and there are now more than 200 vehicles in the wild to date. A high quality and low cost design paired with a highly configurable and customizable design, the BlueROV2 is suitable for a plethora of jobs. The BlueROV2 utilizes the open source ArduSub software, based on the renowned unmanned aerial vehicle (AUV) platform, ArduPilot. The software is actively developed and improved by Blue Robotics and other contributors, with constant upgrades and improvements to make the BlueROV2 even better. Support for new features and accessories is currently in development. Since its launch last summer, kits have been undergoing frequent improvements allowing for an even smoother build process. In its current state, the kit requires no soldering, potting, or gluing and can be assembled in about eight hours. Blue Robotics has recently released a lithium-ion battery (14.8V, 18Ah), which is now shipping to countries in North America, Singapore, India, Japan, New Zealand, Australia, and will soon be available to most of Europe. The high capacity custom battery pack is made from high quality 18650 lithium-ion cells designed to fit perfectly inside the BlueROV2’s watertight battery enclosure. This battery allows up to four hours of continuous moderate use on the BlueROV2 and can be swapped in seconds. On the market for just over eight months, the BlueROV2 has already proven itself through hundreds of hours of successful missions in the field. By partnering with local California businesses and organizations, Blue Robotics has been able to introduce the BlueROV2 to a number of environments and applications, adding to its ever growing repertoire of capabilities. An inspection of a San Fernando Valley water reservoir, an investigation of plane wrecks in the Salton Sea, and a survey of the hull of the Battleship USS Iowa name just a few of the many missions performed recently with the BlueROV2. The BlueROV2 has been and will continue to be critical in advancing ocean accessibility for the masses.